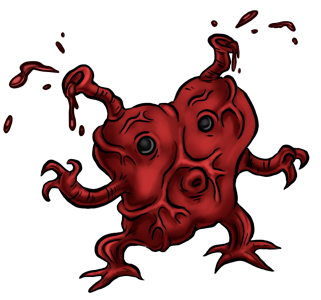 An unstable, experimental prototype Kreature's nucleus accidentally grew inside its of own heart, which subsequently mutated into a wholly separate organism. It has a watertight, translucent membrane to prevent itself from drying out. It is known to be docile, affectionate, loyal, and makes a good pet. Its rhythmic throbbing can induce a soothing feeling in its Tamer via infrasound. It stores up extra blood and can superheat it to scald an opponent. If need be, it can take a genetic sample from an organism and copy its blood type and composition, allowing it to supply blood for transfusions.